This post unfortunately is not an OOTD as the lighting quality wasn't the greatest in my living room. You can't exactly see the outfit clearly in the photos and I might use this outfit for a future feature anyway. However I did like this particular photo taken by my sister (thanks!) 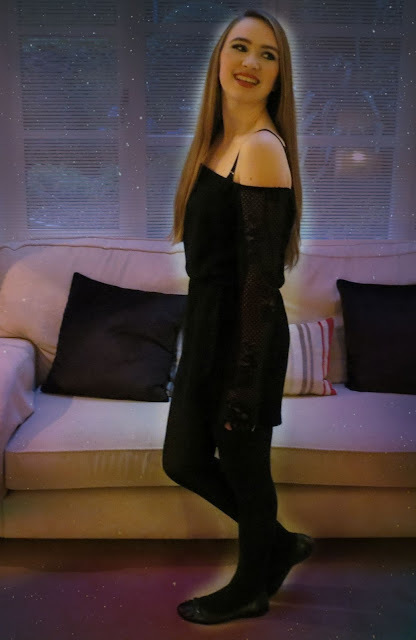 at my Mum and Dad's fiftieth last Saturday the 19th (which I will get to eventually) so I thought why not edit it to make it look cooler with a galaxy effect and include it in what actually is an update post on Queen of Quirk! This month, I have begun a whirlwind of a year that is known as fourth year or Transition Year. I went camping after receiving my Junior Cert results, and since then I haven't been busy but have been super busy at the same time. Evenings consumed by minor assignments, homework, project beginnings but mostly procrastinating have stopped me from blogging or YouTubing as much as I would want to. There's also a tiny bit of creator's block in there and that just screws everything up. 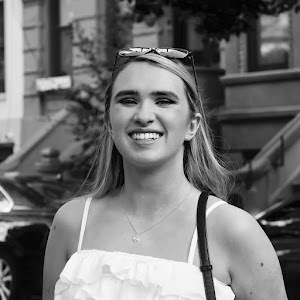 With a name like Queen of Quirk, I'm hoping to make my blog and YouTube content (if you haven't subscribed and would like to, click here) more creative, unique and quirky I guess! That's an easy statement to make but a difficult task to do, but I'm working on it. Queen of Quirk is my online persona and blogging and making videos are my hobbies, if not passions, and I want to improve these hobbies of mine and improve on reflecting my true personality all the time. It's tough. I'll get myself and online life together in the next few weeks in all my time of nothingness and busyness! If you read this post, you would know that as well as the start of Transition Year comes the beginning of the 'TY' section of Queen of Quirk! I'll be documenting all I do (maybe not all, but definitely the best parts) in this fun year right here and on my YouTube. For Gaisce, I'm helping adults with special needs with arts and crafts for community involvement, playing golf for physical activity and learning First Aid for personal skill. I have joined the Newsletter and YSI teams, and I am starting a Mini Company with two friends. On top of that are projects, courses, work experiences, modules and trips. I'm so happy because I've signed up for lots of things this year and I can't wait to get out of my comfort zone. I finally uploaded my Belsonic vlog to my YouTube channel this week. That night back in August was a complete blur, and at one point it literally was a blur. twenty one pilots came on with their song 'Heavydirtysoul', and it began to lash rain, and that was not ideal for me as a glasses wearer. The water smudged my glasses, and I'm practically blind without them considering I wanted to see my loves Tyler and Josh as clearly a possible. At least I heard them, and watched them through my camera on my phone. The rain ended soon enough, so all was good eventually. It really was an amazing night and I am sooooo happy that I got the chance to see twenty one pilots and All Time Low live. I'll actually be seeing All Time Low again next February! Hopefully soon enough twenty one pilots will come again. One week this month in between boring school days, I got to experience some events in the Dublin Fashion Festival. You can read about two of the events here and here, but one I hadn't mentioned here was that I went to Jervis Shopping Centre to see a few fashion demonstrations hosted by Suzanne Jackson. You might have seen my Instagrams and Snapchats (queenofquirk ;D) featuring the shows, but the main reason I went to the shopping centre was to try and meet and possibly take a photo with Suzanne. I of course failed. After her show, she started walking away to the backstage area or somewhere like that, and I had no courage to run after her. Typical. In all good news, I bought some fantastic clothes for autumn and winter that day! On the 19th of September, which was also's my sister's actual birthday, my parents threw their joint fiftieth, or one hundredth, birthday party. Caterers and waiters and lots of unfamiliar faces crowded my house for the evening, and a marquee took over my back garden. I was glad to have my friends Evelyn and Lauren there, as we sat and talked for ages in my room, hiding away from the adults. They kindly had me over to theres for a sleepover (they're also my neighbours). We watched St. Vincent but I fell asleep half way through, exhausted. The next morning after the party, I read Kiloran's first issue while I waited for my friend's to wake up. Kiloran is an amazing new website / online magazine, or 'a collective of people creating a collective of things'. There are so many beautiful, inspiring and thought-provoking pieces, but my favourites are 50 Things That Shouldn't Exist in 2015 and Everything in the Universe Was Alive. I loved reading Kiloran so much I decided to email them in the hope of becoming a contributor in the next issue. Guess what? I will be contributing in the next issue! I'm super excited to join a creative team and, fingers crossed, create good content for Kiloran. Let's talk about the future for once! This next week is to be packed with travelling, photo-taking, screaming and singing. I'll be heading to Scotland on Tuesday night with my sister Emily and Dad for one night. Emily is interested in going to St. Andrew's University so I decided to join her with Dad in looking at the campus on the open day on Wednesday. I'll be vlogging and taking pictures, so you'll read all about it! The screaming and singing of this week will be at Fall Out Boy this Thursday. It feels so unreal that I'll be seeing them, and I'm sure it will be a fantastic concert. That's the majority of what has happened, what's been happening lately or what is to happen!